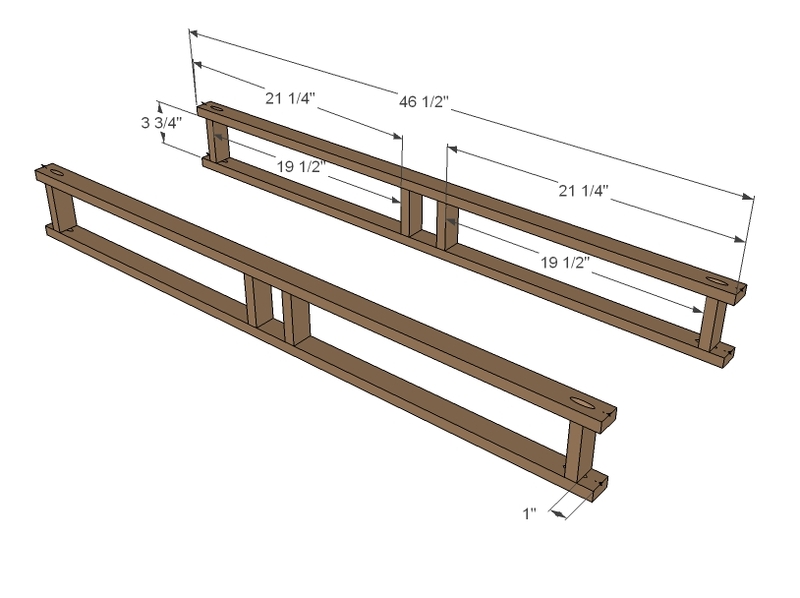 This plan assumes the following board sizes. 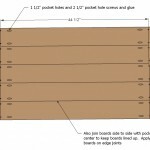 Make sure you boards are these widths or this plan will not work right. 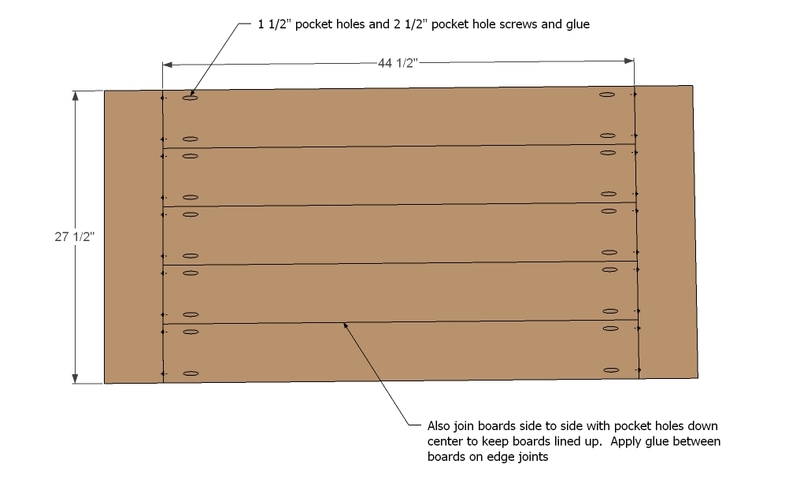 If your boards are a different width, you will need to rip to the right size or adjust the plan to fit your board widths. 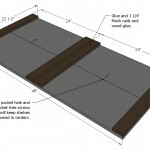 cutting as you go for the best fit on trim boards. 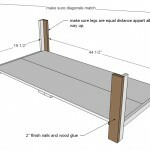 Mark all legs 4 ¾” from base and attach to the bottom shelf. 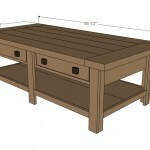 Aternatively, the legs can be attached with pocket holes. 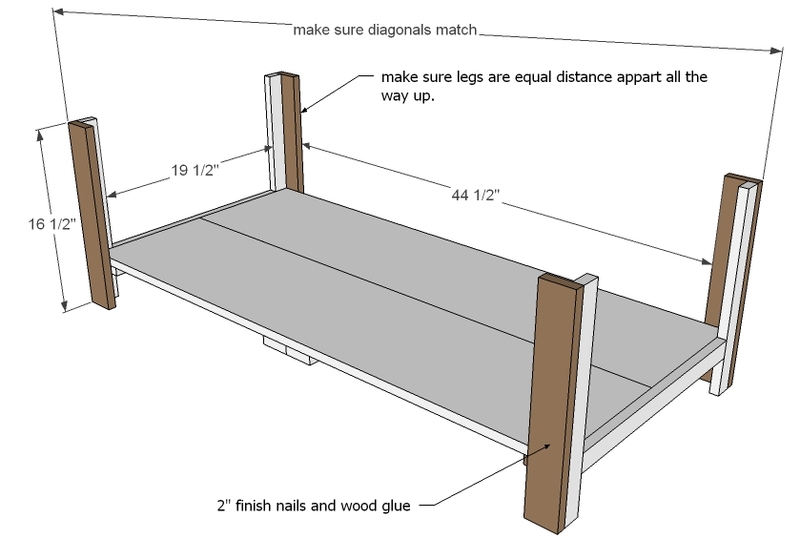 Use glue and make sure the legs are attached square, with the distance between the legs equal all the way up. 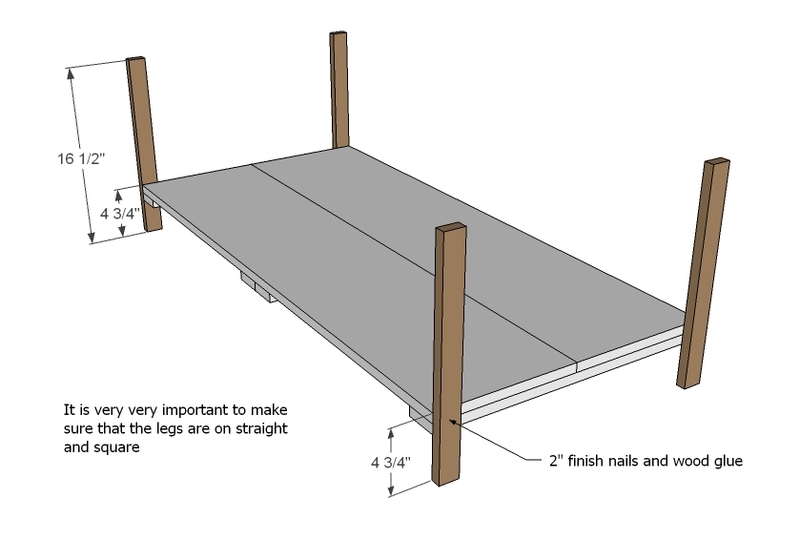 Once the 1×2 legs are on, add the 1×3 legs. 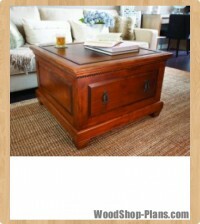 Keep outside edges flush to make legs appear as one solid leg and check again for square. 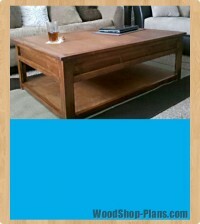 Also take a diagonal to ensure the table is square. 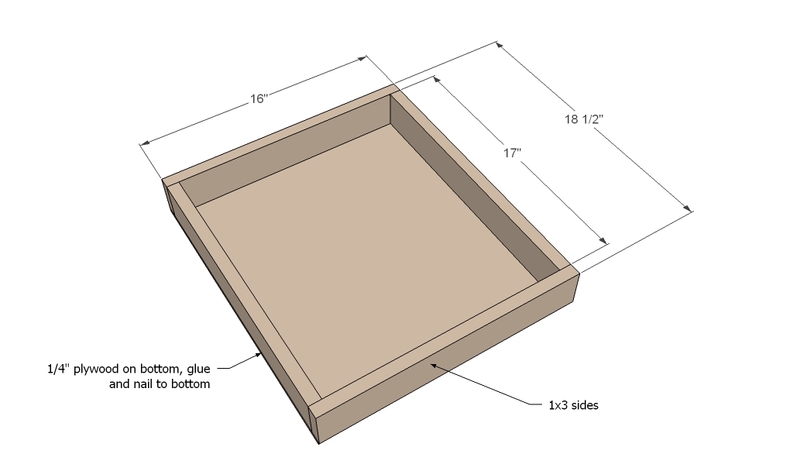 This is very important because if your box is not square, your drawers will not slide correctly. 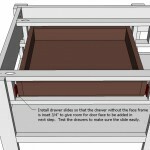 Attach back apron to top back side as shown above. 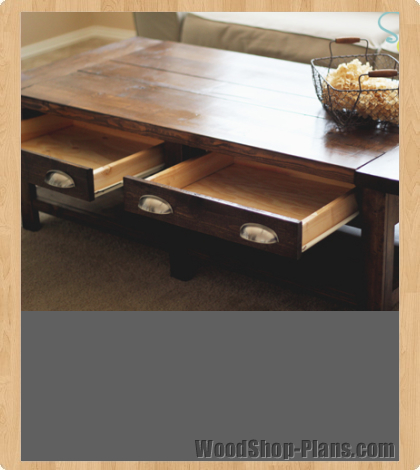 Use glue and 1 ¼” finish nails. 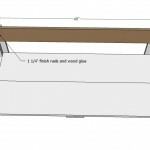 Also attach end 1x2s to the back apron with 2” finish nails. 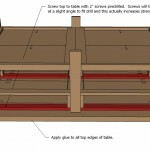 Side aprons are attached same as back aprons. Make sure everything is still very square. 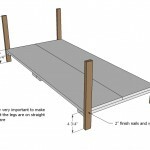 Measure and mark placement of center legs. 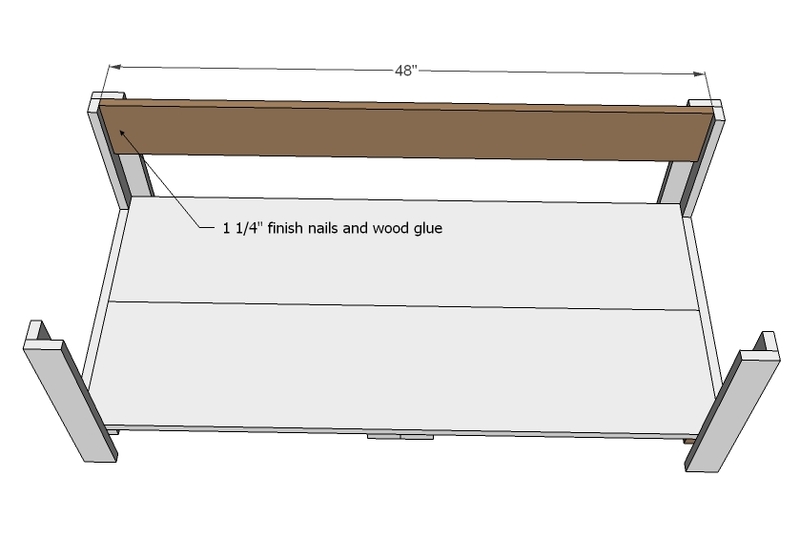 Nail and glue to project, ensuring legs are placed square with bottom shelf and parallel to end legs with an equal distance between the front legs. 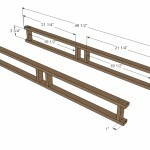 Bottom shelf trim is nailed on flush to top. 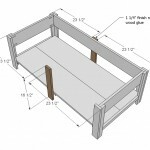 TIP: Measure and cut to fit for best fit. 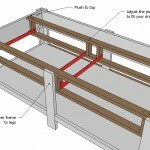 Attach side trim as well. 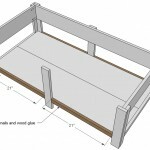 The drawer frames also work to trim out the front of the project, so test after building to make sure they fit correctly. 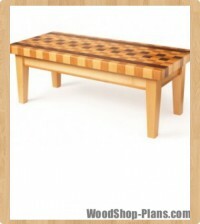 These are made with 1×3 boards for extra strength – if using pocket holes, drill two pocket holes per end. 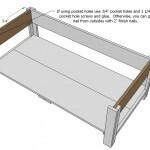 These must be built exactly square and exactly the same for the drawers to slide correctly. 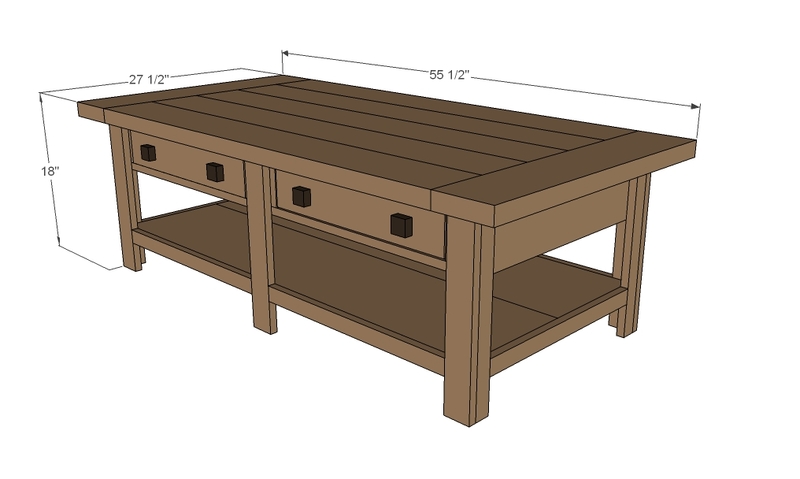 Install drawer frames in coffee table top, flush to the top as shown in diagram. 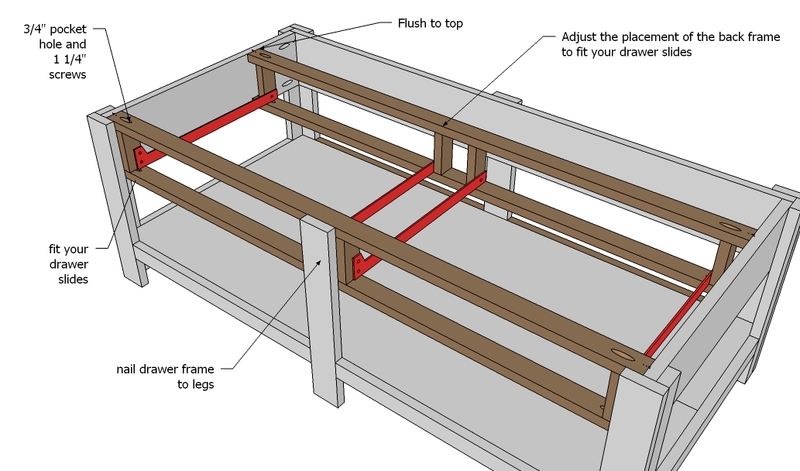 Place back drawer frame to fit your drawer slides as shown in diagram. 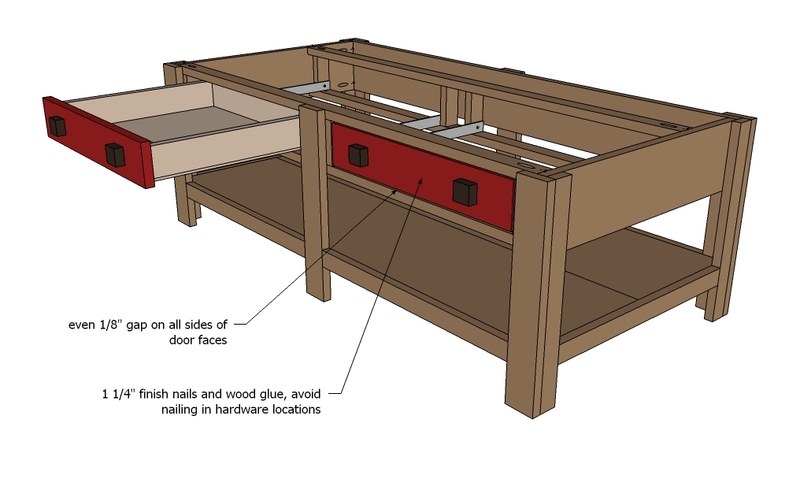 The slides need to sit ¾” inset from the front of the front frame to allow for the drawer face to hide the slides. 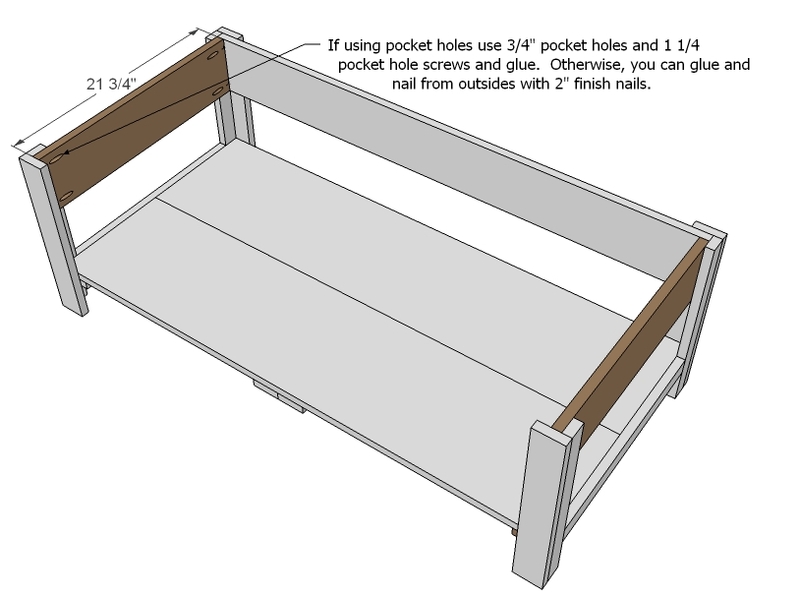 Drawers need to be built 1” less than the opening width to allow for drawer slides. 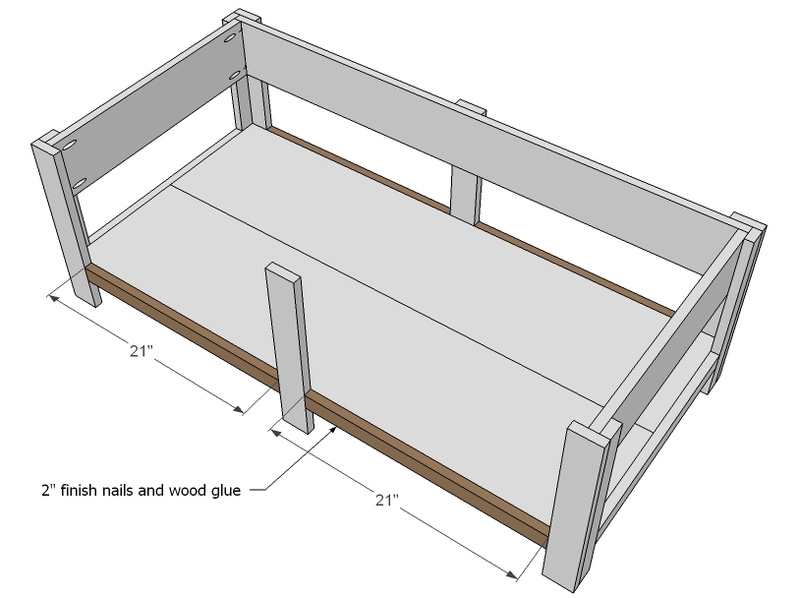 Build drawers from 1×3 boards, and attach plywood to bottom. 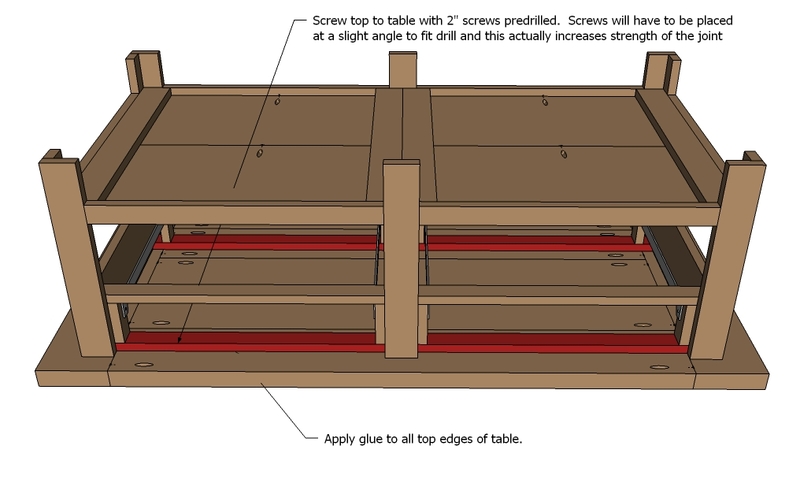 Attach drawer slide drawer members to bottom of drawers. 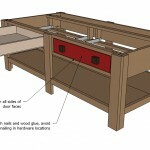 Fit drawers in cabinet, making sure they slide smoothly and easily. 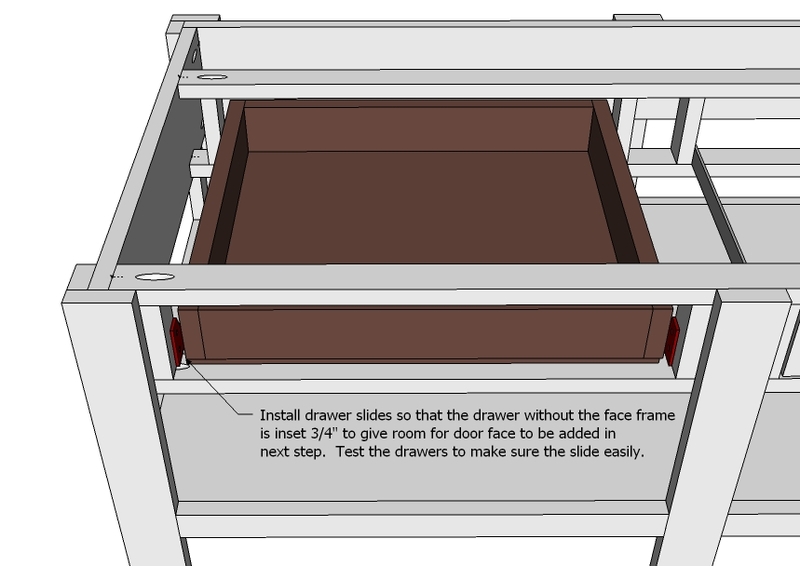 Remember the drawer face still needs to be installed. 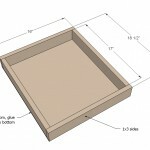 Drawer faces are nailed to drawer box with 1 ¼” finish nails and glue, with an even gap around all sides. 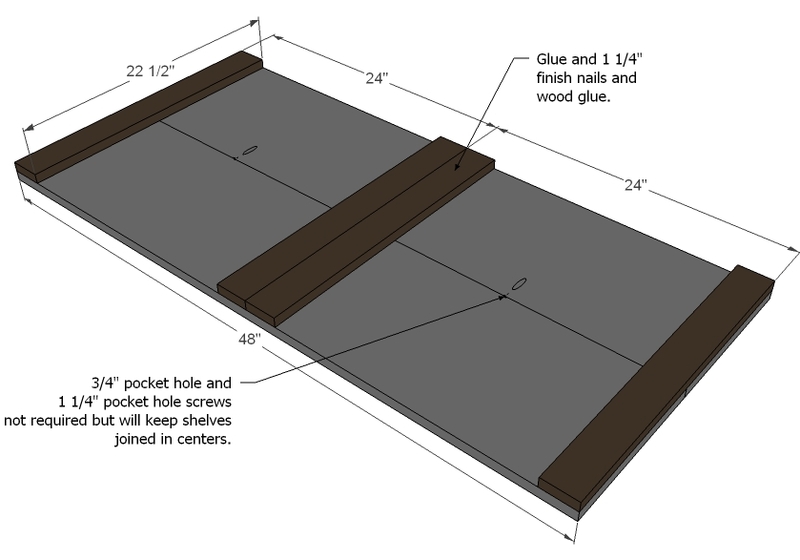 Attach hardware – you may need to drill special holes to accommodate the drawer hardware with the double thick face by drilling through drawer box with larger bit sized for screw head, and drilling through face of drawer with bit sized for screw shaft. Remove drawers. 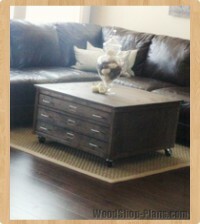 Attach top to base as shown above with 2” screws and wood glue. 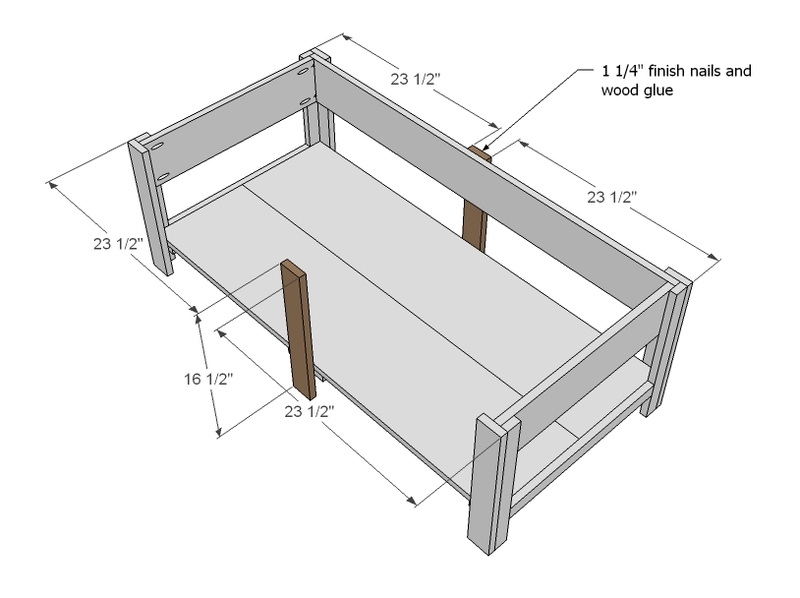 And here’s the top diagram.